I had a meeting this morning with the Chuck and Julie they’re the group designing my website and needless to say I have a lot to learn. I hope you will support and understand that this website/blog will be ever evolving and changing (for the better, I hope) as I learn all the ins and outs of this wonderful media. This first attempt is very bare bones and is still not 100% complete. Hopefully it will continue to grow in a positive direction and be a place you will want to visit from time to time. I have taken on quite a bit this year. Starting an art career,entering shows, setting up a website/blog, getting a smart phone… an adventure in itself. Until a few days ago I still had the basic flip phone which my verizon guy laughed at and said “boy this is gonna be a real learning curve, it’s like your going from a Hugo to a BMW.” Thanks buddy, way to boost my confidence. This year is the beginning of a brand new chapter in my life. I’m trying very hard to just go with the flow and understand that I cannot do everything by myself or all at once. I’m slowly learning to graciously rely on the generosity and expertise of others to help me through. Here’s to a great 2012. Next weekend will be my first juried outdoor art show. 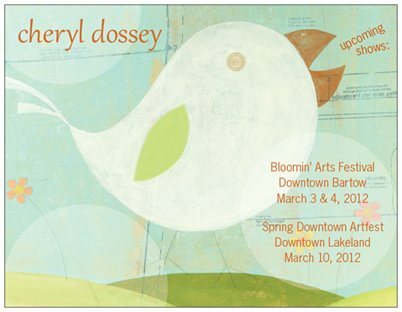 Bloomin’ Arts Festival in downtown Bartow. It’s a two day show, Saturday March 3 and Sunday March4. Hopefully you can come join the other artists and I for this wonderful two day event. Well, I survived it. My first solo art show at Mitchell’s Coffee House in downtown Lakeland. 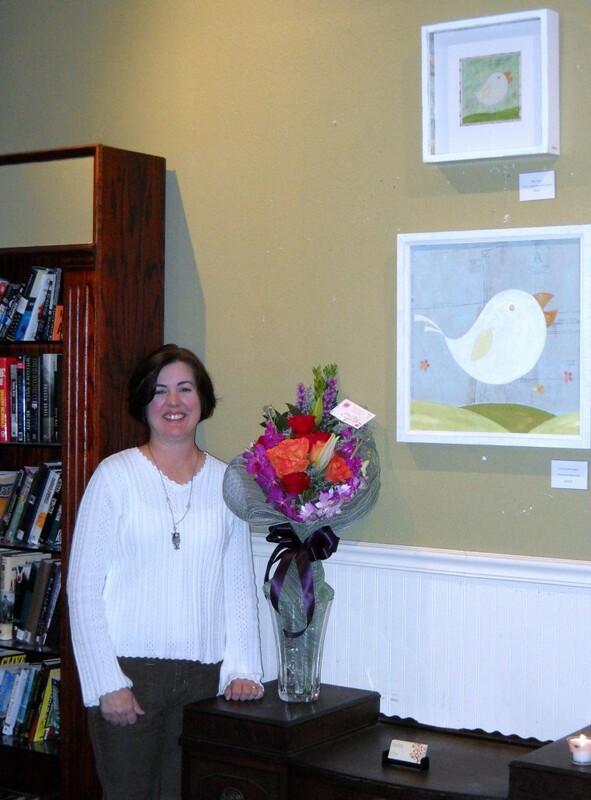 Michelle Harvey, the owner invited me to show my work at the end 2010 after my decision to close Fitz Gallery. I thought why not, schedule me for January 2012 I should be ready by then. Little did I realize the procrastination gremlin would rear its ugly little head and throw a wrench into my very well designed perfect plan? HA! HA! HA! Fortunately for me I have always been good under a certain amount of pressure. In the final weeks of preparation as I was trying to finish all the pieces I had half started all over the place it was actually quite fun. My creative juices were flowing and everything else seemed to disappear as the hours just flew by. I’ve forgotten what it feels like to be in that peaceful wonderful state. The place I share with my creative spirit, the one who lets me be exactly who I am without question, doubt or fear. I’m so grateful that I have been given a second chance to be in this place again. My hope is I will never bury my creative spirit again in the craziness of everyday life and that I will let her soar whenever she feels the need. I want to again thank Michelle Harvey of Mitchell’s for believing in me and all my friends and family for coming out and supporting me on opening night. In closing I would like to dedicate this first post to my best friend and husband Warren and our son Wyatt. Warren you are the love of my life and the true wind beneath my wings. I’m truly blessed by all your love, encouragement and support. And to our son Wyatt, who is without a doubt the greatest creation we will ever be a part of. I love you both with every fiber of my being. Thanks for visiting my blog and may you embrace the creative spirit within and enjoy the journey especially designed for your life.